This year, Nepal regional coordinator Sushil Bhattarai organized the first Asteroid Day event in the Kavre district of Nepal. This was the first event in Nepal outside of Kathmandu, the country’s capital. 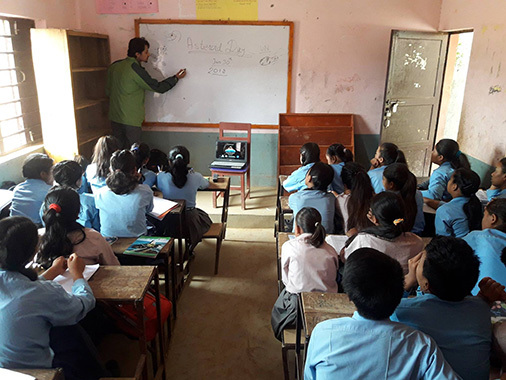 Sushil brought his laptop to Shree Shankheshwor Mahalaxmi Secondary School, one of the oldest government schools in the country, to talk to students in class 9 and class 10. The students were not familiar with many ways students learn about the solar system. They did not have any experience with any scientific TV programs or using the internet to learn about science. Sushil demonstrated the basics of the solar system, Newton’s laws and asteroids on a whiteboard, and then showed an Asteroid Day video on his laptop. The students were incredibility interested and asked lots of questions. The event, which Sushil expected to last ninety minutes, continued for three and half hours. Sushil plans to continue to bring Asteroid Day to more remote schools in Nepal in future years.